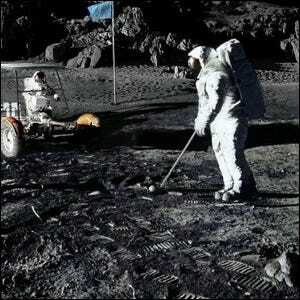 What Sports Equipment Was Left Behind On The Moon? Early 2D Video Game Characters Were Known As What? The lunar surface is scattered with all manner of artifacts left behind by decades of moon missions. Cast off lunar landers, rovers, and equipment are all par for the course when it comes to the delicate process of getting to the moon and back safely. Among the equipment left behind, however, is some of a more sporting nature. For that, we can thank Alan Shepard–accomplished astronaut and the commander of the Apollo 14 moon mission. In addition to successfully commanding American’s third manned lunar landing, he’s also responsible for the first sport played on the moon. Shepard smuggled two golf balls and the head of a Wilson six-iron golf club inside his space suit. Once on the moon, he attached the modified head to the handle of a lunar sample retriever, dropped the balls in the dusty surface of the moon, and put one in the history books with the first off-Earth golf drive. All of us wanted to think of something which would demonstrate — especially to young people — the lack of atmosphere and the difference of the gravity. The gravity is only one sixth that of Earth, and here is a total vacuum up there. Some of the clever guys before us had dropped a little lead ball, and a feather, to watch them slowly proceed at exactly the same rate to the surface. It’s the sort of demonstration that had been used before. Being a golfer, I thought if I could just get a club up there, and get it going through the ball at the same speed, that it would go six times as far as it would have gone here on earth. designed a club head to fit on the handle we used for scooping up dust samples. I cleared it with the powers that be, and practiced in a space suit before we went to be sure there were no safety implications. The deal I made with the boss was that if things were messed up on the surface, I wouldn’t play with it, because we would be accused of being too frivolous. But, if things had gone well, which they did, then the last thing I was going to do, before climbing up the ladder to come home, was to whack these two golf balls. Which I did, and I folded up the collapsible golf club and brought it back with me. The balls are still up there. Perhaps the youngsters of today will go up and play golf with them some time, 25 or 30 years from now.